The sky’s the limit in the newest game from Formal Ferret Games! 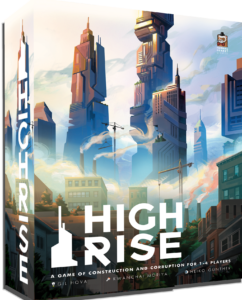 High Rise is a citybuilding strategy board game with a bit of corruption. In the game, you and your opponents are constructing skyscrapers in a somewhat reputable city. You’ll move around the board on a one-way track, choosing any unoccupied space ahead of you and doing its action, and waiting for everyone to pass you until you take your next action. Most of the spaces on the board represent Tenants; various corporations and government entities who would love to move into a notable new building. Each Tenant offers a different power for players who land or build on them. The best part is that the game comes with 45 Tenants, of which you’ll only use 15-20 of (depending on player count), so every game you play will require different strategies and plans depending on which Tenants are on the board. Introductory mode – An abbreviated 2-round (100-minute) version of the game that lets new players jump right into the game. Standard mode – An abbreviated 2-round (100-minute) version of the game that lets experienced players each construct a Building on a Tenant during setup, giving everyone a unique path before the first turn. Full mode – The full 3-round (150-minute) version of the game. Packed full of deep and interesting decisions. The game will feature art from Kwanchai Moria and graphic design from Heiko Günther.